Email us your paper along with the specific description of the assignment. We will comment on the paper in regards to purpose, organizational structure, internal organization, format, and patterns of grammatical error. Allow up to 48 hours for tutors to respond to online submissions. 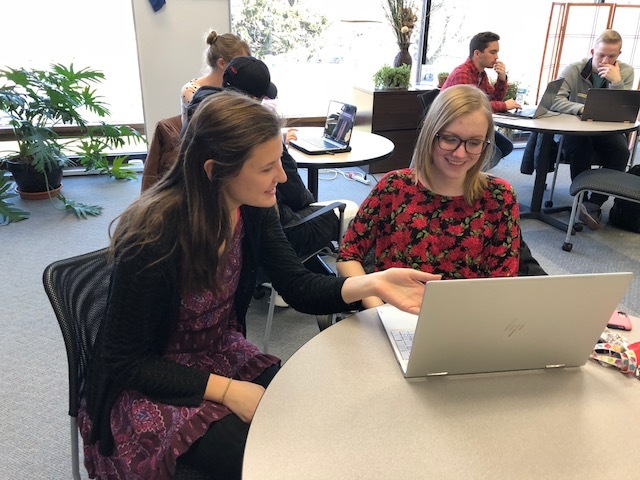 The Writing Lab is a free service available to all undergraduate and graduate Grace College students desiring help with written assignments at any stage of the writing process. Writing Lab tutors are students, typically in writing-intensive majors, who have proven themselves to be competent writers. These tutors read student papers and make suggestions for improvement, concentrating on higher order concerns such as purpose, thesis, organization, and content. However, they also provide formatting help for all major writing styles: MLA, APA, Chicago, Turabian, and Associated Press. The Writing Lab also offers tutoring in grammar and proofreading skills, along with a variety of writing resources such as style manuals and example papers. Undergraduate or graduate students may come in to the Writing Lab for help during walk-in hours, or they may email papers with the assignment description to the Writing Lab at writinglab@grace.edu. Students may also schedule a weekly face-to-face appointment with a tutor. Appointments are conducted in the Learning Center of the Morgan Library. You may also call extension 6427 or email writinglab@grace.edu to request an appointment with a Writing Lab Assistant.